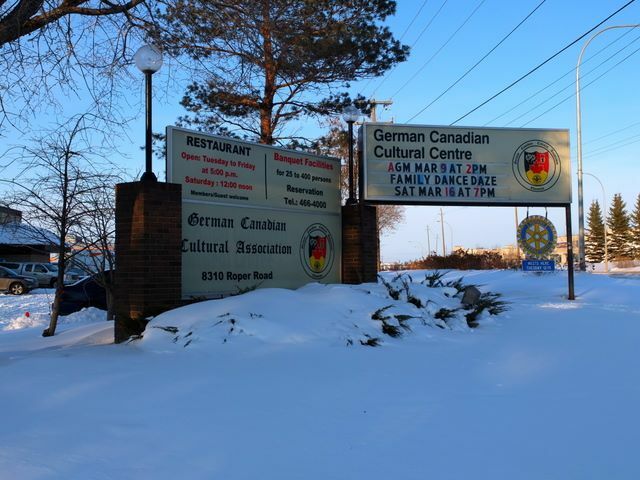 While Googling to to find a different German restaurant I'd been recommended (I couldn't remember the name Bauernschmaus), I stumbled on to the website of the German Canadian Cultural Association (GCCA), and discovered it had an associated restaurant. They're open for dinner Tuesday to Saturday , as well as lunch on Saturday. 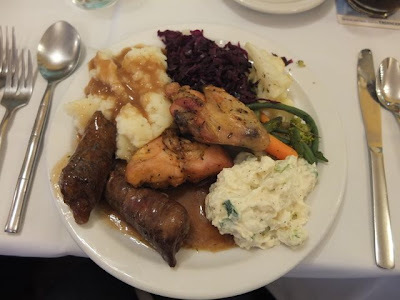 In additional to their traditional German menu, on Friday and Saturday evenings they put on a buffet. I thought this sounded like a place to check out, and set up a Meetup with the Edmonton Foodies to visit. When I arrived, I was directed to the restaurant, which is located just through the lobby of the of the GCCA. The space was bright but fairly nondescript in decor, and reasonably busy. The buffet was the most popular choice with other parties, so after ordering some Erdingers, we headed over to help ourselves. Though I was tempted to start with desserts (see below! 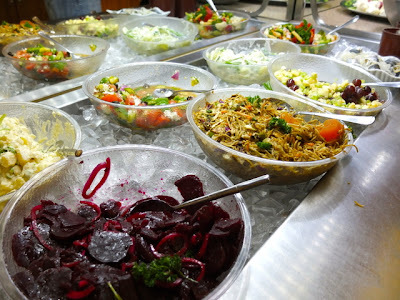 ), I visited the soup and salad bar first. The soups change every week, and appear to be homemade. The salads are a weekly staple, and there was plenty of options to choose from, including beet, pasta, greek, fresh veggie sticks and smoked fish. The potato salad, mayonnaise-based but shining with a twist of dill pickle, was my personal favorite. The main buffet options change week to week, and can be found in advance on the GCCA website. I'd run out of room for the salmon with lemon butter, but was able to fit most of everything else on my plate (as well as a second helping of potato salad). The mashed potatoes and roast chicken were generic, but acceptable. Though I'm generally a big fan of braised red cabbage, theirs was a bit dry and disappointing. I don't see rouladen (a mix of onion, pickle and bacon rolled up in a steak) on menus very often, and really enjoyed this one. I was pretty stuffed, but of course found room for dessert. Between the strudel, pies, cakes and fruit it was a tough decision, but narrowed it down (slightly). While I was not blown away by the strudel, the German chocolate cake was deliciously and gooey with a sweet filling between the layers of moist chocolate cake. 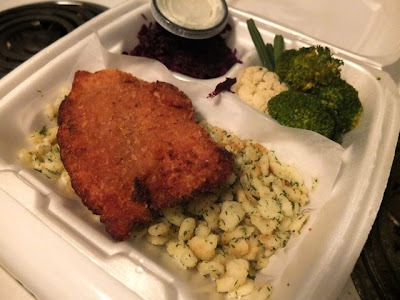 Since neither schnitzel nor spaetzle were on the buffet that night, I decided to take some home with me to have for lunch the next day. The chicken schnitzel was lackluster; I much prefer Continental Treat's. The spaetzle, however, were dusted with herbs and were cooked in butter just enough to have a few crunchy bits. They might be the best I've had outside of Germany. The general response from my group was extremely positive. The food was fresh, which is a challenge for a buffet. There was plenty of variety, and the options were all reasonably good, and, at $18.50 per adult, the consensus was that the value was excellent. While you might not find an out-of-the-park homerun (unless spaetzle is on the buffet that week), if you're looking for a good option for a group or a fresher buffet with comfort food and a good variety, you might find what you're looking for at the GCCA. A few more photos from our visit can be found here. Though Dishcrawls have been happening in Edmonton for about a year now, I'd never signed up before. The concept is certainly interesting: a location is selected, and 48 hours before the event participants are notified of the meeting point and first stop. 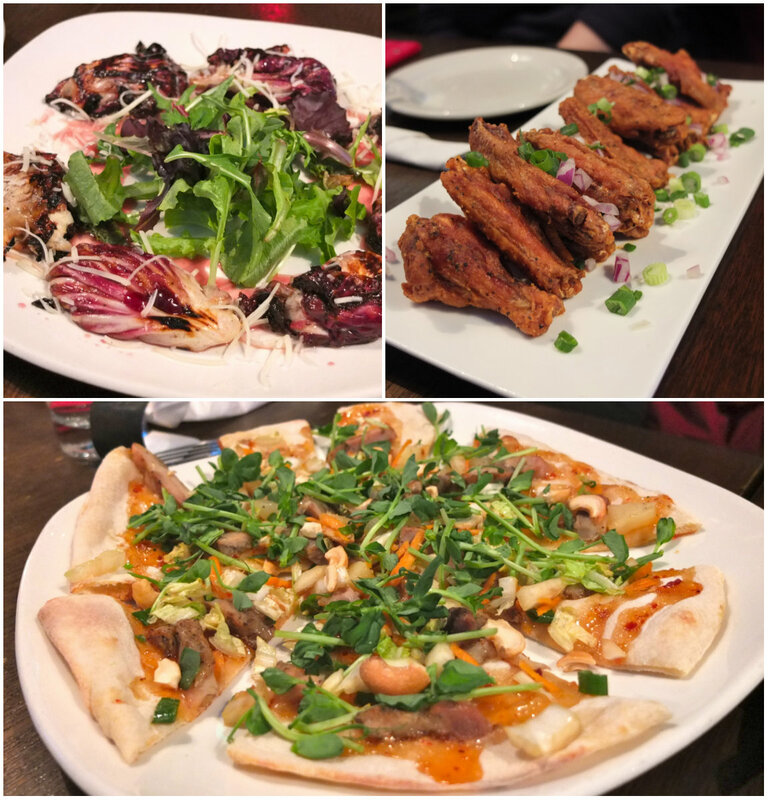 From there, Dishcrawlers are guided through visits to four different neighbourhood restaurants. Basically, it sounds like an epicurean fantasy. So when a brief break in my schedule coincided with Dishcrawl's Oliver event, I jumped! Our meeting place, and first stop that night was RoseBowl Pizza/Rouge Lounge. Though RoseBowl Pizza has been around for decades, the owners have more recently renovated and rebranded the establishment as Rouge Resto-Lounge (which continues to serve the familar Rosebowl Pizza) to increase their appeal as social destination rather than just a restaurant. The salt 'n' rouge wings arrived at the table first. They were salty indeed, with very mild heat. When serving a group like ours, I suppose it's necessary to keep it mild, but I would have preferred a bit more flavour from these. I've heard great things about their pizzas from others, but The Orient pizza, a well-intentioned combination of grilled chicken, pineapple, carrots and onion drizzled with sweet chili sauce and topped with pea shoots, was surprisingly underwhelming. The grilled raddichio, on the other hand, capped our stop off on a high note and was the hit of the visit; anything filled with bocconcini and wrapped in proscuitto is sure to please. I'd been curious about Rosebowl for sometime, so it was great to get a chance to sample its offerings. I wasn't blown away by most of the food, but the atmosphere they've created is conducive to a fun social outing, and I would return for drinks and the grilled raddichio again. Our next stop was il Pasticcio Trattoria. Though I'd visited once before and enjoyed it, the dishes we were served on the Dishcrawl were new experiences. il Pasticcio was first opened by owner Nello Saporito (also behind Nello's in St. Albert) in 1994. He sold it 10 years later, but after it languished under the new owners, Nello bought it back, and re-focused the restaurant on its traditional old-world Italian foundations. 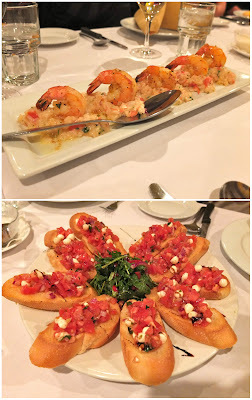 The first dish to arrive was the bruschetta with bocconcini cheese. It was an excellent way to kick of this stop. Somehow, even in the winter, they'd found colourful, flavourful fresh tomatoes which were very refreshing. I wasn't overly moved by the gamberi risotto, but this opinion seemed to be in contrast to the majority of the diners. The most simple dish of all, the penne with tomato sauce, was the favorite of the stop, and possibly of the entire crawl. The tomato sauce was a lovely balance of mild seasoning which enhanced the bright tomato flavour. Biting into the perfectly al dente penne was incredibly pleasing. The fundamental principle of il Pasticcio's menu is well-executed simplicity over unnecessary complexity, and the penne with tomato sauce is the perfect embodiment of this ideal. Adequately full from il Pasticcio, I was happy to get on my feet and walk as we headed to our next stop, Co Co Di. Specializing in Lebanese food, Co Co Di first opened on Rice Howard Way in 2001, but, after a 2009 fire decimated the block, later moved to its current Jasper Avenue location. Apparently belly dancer rock the joint on Fridays and Saturdays, but the restaurant's atmosphere was quite unexciting on our weekday visit. Unlike our previous stops where the food was served family style, at Co Co Di we received our own plates of hummus, salad, and a meat pie. 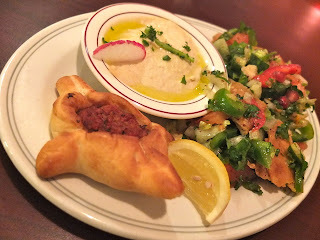 The hummus packed a decent punch of garlic and was drizzled with a high quality oliver oil. Perhaps it had been prepared to far in advance, because, by the time it got to me, my fatoush salad was soggy and limp. It's difficult not to compare restaurants; even more so when you're visiting them in quick succession. Perhaps I would have been more impressed with Co Co Di had we visited prior to il Pasticcio and the bar weren't set as high, but the experience was, unfortunately, anti-climactic. The fourth, final, and dessert(!) stop of the Dishcrawl was Niche. 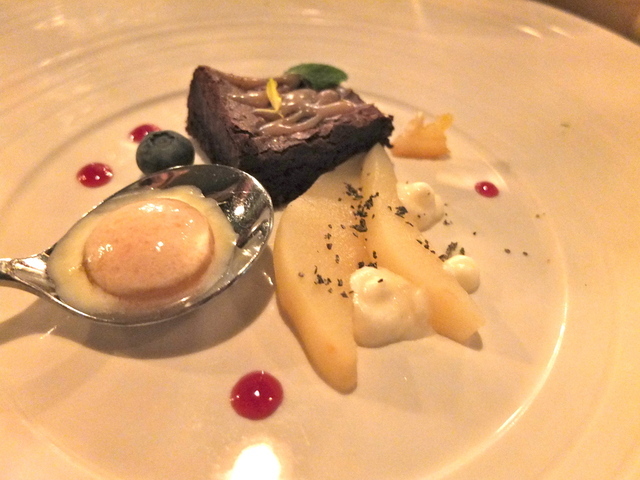 I've eaten at Niche several times previously but never had room for dessert. I've always found their execution of the meals I've had there creative and tasty, so I was keen to see what they had up their sleeves for us. After sitting down, the chef emerged from the kitchen to give us an orientation to the desserts we'd be receiving. The white wine poached pears were lovely, and the pinch of thyme gave them an interesting edge. We were instructed to slip the gastro bubble, whole, on to our tongues. As we slowly pushed it to the roofs of our mouths, the bubble suddenly exploded with a burst of lemon. The flourless chocolate brownie was more straightforward, and was in nice, decadent contrast to its lighter fruity partners. I was pleased, but not surprised, with interesting and delicious desserts we received at Niche. I will have to save room for the course more often. I enjoyed the time the chef spent talking to us at Niche, and I would have liked to have heard more about the food and restaurants from the owners at the various stops. It was also freezing that night, and the group dispersed at the end, so the walk back my car at Rosebowl from the last stop at Niche was miserably cold and a tad sketchy. It would have been nice to know receive a tip in our initial email about a good location to park at a midpoint between our first and final stops. Overall, however, I had a blast. With respect to the food, there were some big hits, a few misses, and some in-betweens, but that's to be expected. It was a great way to try restaurants (or at least dishes) I had not previously experienced, and it's always fun to be in the company of others who love food.